The Ring of Kerry drive in Ireland has been on my bucket list since my first trip to Ireland over 10 years ago. I was excited to finally get the chance to experience it for myself. I knew it would be a scenic road trip with lots of interesting places to stop along the way. In spite of my research, we weren’t sure which places were worth visiting along the way. We had trouble finding detailed information to plan our Ring of Kerry itinerary. After exploring the area, I can give you some recommendations. In this post, I will share some of the best things to see on the Ring of Kerry and other helpful planning tips. While this is not a comprehensive list of every attraction in Kerry, it will keep you entertained for at least a few days! If you don’t have a few days enjoy the time you have. For us, once around the Ring of Kerry was not enough. We hope to make it back to see more. Where is the Ring of Kerry? Is the Ring of Kerry Worth It? So many stunning views along the Ring of Kerry! The Ring of Kerry is a 111-mile circular scenic drive in the southwestern part of Ireland. It goes along the dramatic coast and through rugged mountains and cute towns. Many visitors plan on driving the Ring of Kerry in one day. You will want to make many stops for photos and exploring so allocate more time if possible. The first thing you learn when you are reading any Ring of Kerry guide is to drive counter-clockwise around the circle. We went at the very tail end of the season (1st weekend in October) so there wasn’t much traffic, but I have heard this is not the case in the summer, so be prepared. (If you are planning on going in the summer, you with find this Ireland Packing List helpful). The Ring of Kerry goes around the Iveragh Peninsula in County Kerry in southwestern Ireland. Most people start the drive in the town of Killarney, which is about a three and half hour drive (191 miles) southwest from Dublin. Check out this list to find the best places to stay when you are doing the Ring of Kerry. If you are concerned about driving on the Ring of Kerry roads, that doesn’t mean you can’t visit the area. You just need to find someone else to be your driver. If no one in your group is comfortable driving, there are plenty of tour options including a Ring of Kerry Bus tour like this one. That way you can relax and enjoy the spectacular scenery. If you don’t want to worry about traveling to Killarney on your own, there are some Ring of Kerry tours from Dublin, like this option on Viator. Keep in mind that it takes about three hours to travel from Dublin to Kerry, so that will eat into the time that you get to see the Ring of Kerry. 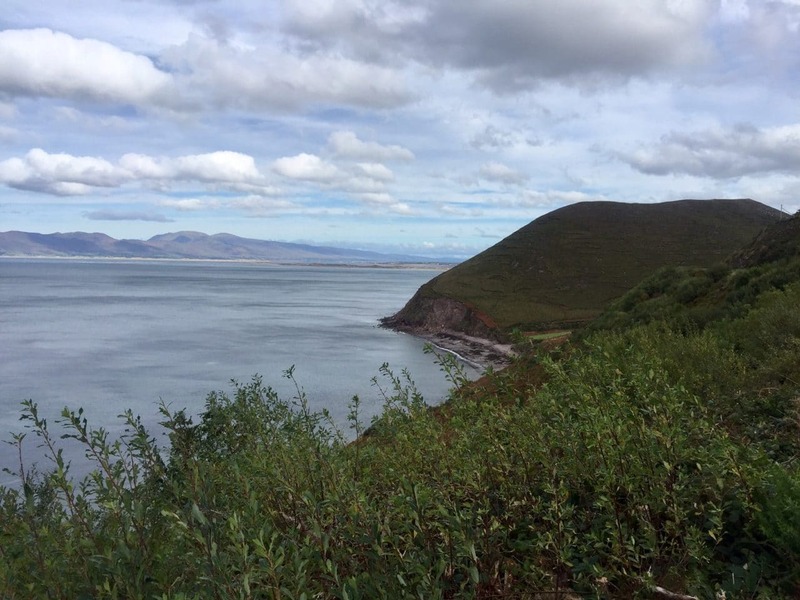 The actual Ring of Kerry drive is not that long (only 111 miles) and can easily be done in a few hours, but you don’t do it justice if you don’t stop along the way and explore. If you are traveling with the whole family, here are some ideas for things to do on the Ring of Kerry with kids. We tried to stop and see as much as we could. Here are the points of interest that we stopped at in the order you would come across them driving around the Ring of Kerry counter-clockwise starting in Killarney. The Gap of Dunloe is a very scenic area close to the beginning of the Ring of Kerry. There are several options of how to explore this area. Most people either do a Gap of Dunloe hike or take jaunting cars, which are a form of horse pulled carriages. I wouldn’t recommend taking the jaunting cars after reading about what happened to my fellow blogger, Angie Away. The weather was a little iffy when we got to the area and we didn’t want to spend too much time at any one place so we decided to explore by car. I would not recommend this approach either unless you are a very experienced driver – thank goodness I have Russell! The Gap of Dunloe road is very narrow, winding, and hilly. It is only one lane wide but it is for two way traffic. So depending on where you meet someone coming the other way, you may have to do some reversing. I was stressed even as the passenger, but the views were worth it. The mountains are so pretty and rugged. Plus we saw some sheep. Oh and we also almost had a head-on collision with a cow. Yes, there was a man walking his cow on the road. Luckily Russell was able to slow down, but we both got a good scare. We got a little lost, went through Molls Gap, and rejoined the Ring of Kerry road in the wrong place. We had to backtrack a little to get where we wanted to go. 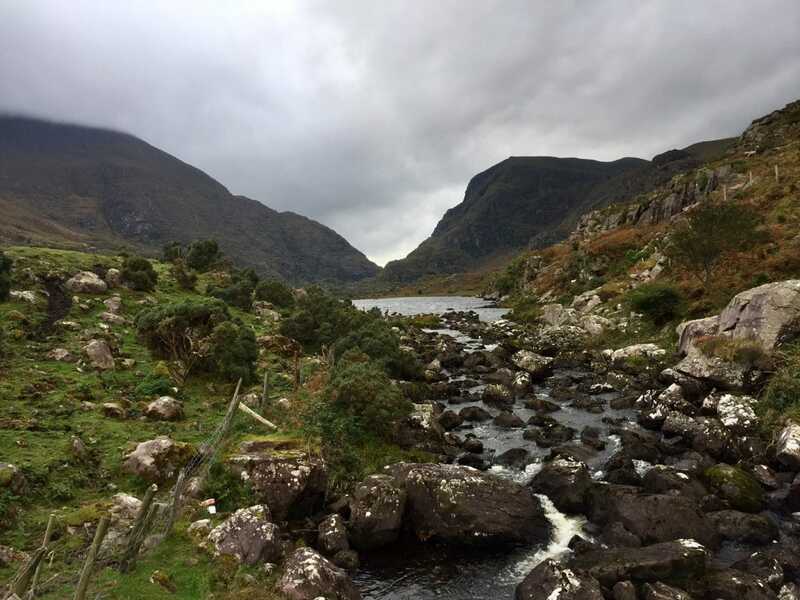 I think if I went back and the weather was good I would really like to do some hiking in Gap of Dunloe or maybe even one of the Gap of Dunloe tours. I would love to go back and do some hiking in the Gap of Dunloe. 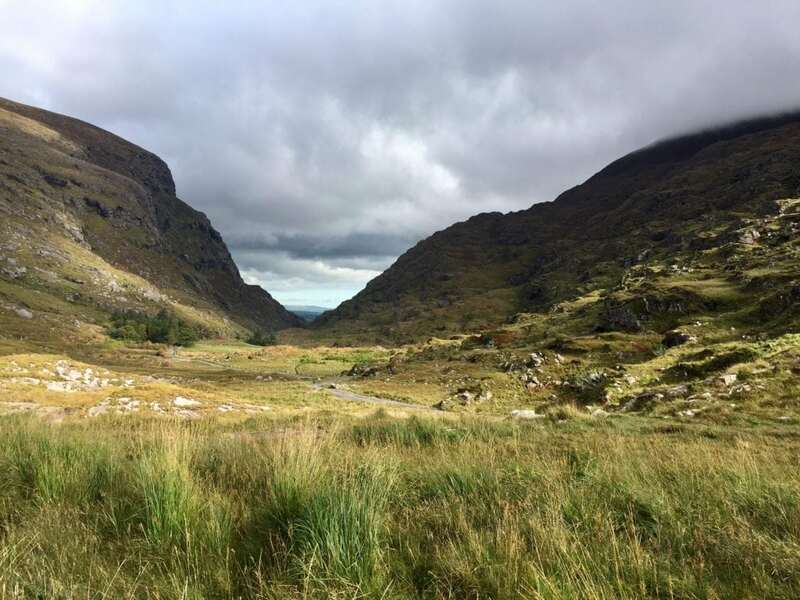 We really enjoyed exploring the Gap of Dunloe, it is such a beautiful area. There are several different rock forts in Kerry, but we stopped to see Cahergal & Leacanabuaile ones. Well, it was kind of by accident that we found them. I saw a sign to turn off for the Ballycarberry Castle and you probably know I am a sucker for a castle. (To find the forts turn off the Ring of Kerry and pass the Old Barracks in Cahirciveen, continue over the bridge, and turn left at the next crossroads. The forts are located approximately two miles down the road in the direction of Ballycarberry castle). Well before we saw the Ring of Kerry castle, the stone forts caught our eye. There was a parking lot on the side of the road, so we parked there and made the short walk to each fort. The Cahergal Stone Fort, which is located closer to the road, was built in 600 AD. The Leacanabuaile Stone Fort is located on the hillside and probably dates back to 800 AD. You can go inside both forts and admire the stonework. The Cahergal Stone fort has some steep stairs inside so you can climb to the top. Can you spot the stone fort? It really blends into the scenery. Russell climbed the stone fort to get some pictures. Valentia Island is located a half a mile off the Ring of Kerry road and measures seven miles long by three miles wide. To get to Valentia Island, we took the car ferry which runs about every 10 minutes from Knightstown. There are several points of interest on Valentia Island, but I had two that I wanted to see. Unfortunately, the famous ice cream shop, the Farmhouse Dairy is only open in the summer, so we didn’t get to try any. I also wanted to see the lighthouse. The road to the lighthouse was very curvy, steep, and narrow, again would only recommend it for experienced drivers. The lighthouse is beautiful and the views are worth the stress of that road. The view from the lighthouse on Valentia island. I was pretty impressed with the Kerry Cliffs! I was really impressed by the Kerry Cliffs, which are definitely well worth the €4 per person entry fee. The cliffs are located a little bit off the Ring of Kerry road. Then it’s about a 10 minute walk from the parking lot. The walk to the cliffs is easy and there are some stone igloo replicas that you can see on the way. We were lucky that the weather cooperated and it stayed dry. Still, as we got closer to the cliffs it got really windy. It’s worth walking along the cliffs though, as they reminded me a bit of the Cliffs of Moher. It might have been my favorite of our Ring of Kerry stops, the views were just stunning and I loved the rugged landscape. The last section of the drive goes through Killarney National Park, which is absolutely beautiful. You can easily spend a whole day here. Check out my post about Killarney National Park for more information on how to spend your time there. 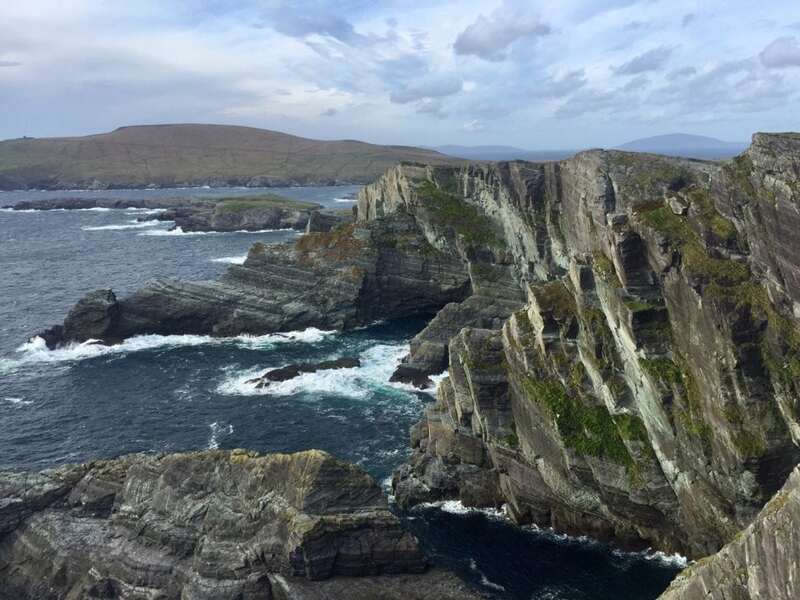 We didn’t have time to see everything that we wanted to along the Ring of Kerry route, so if you have longer you might want to consider some of these options. It is not easy to get to Skellig Michael. Only a few boats can land on the island each day during the summer season. Plus, the weather and tide have to be just right or they won’t be able to. A Christian monastery was founded on the island sometime between the 6th and 8th century and then was abandoned in the late 12th century. You have to climb about 600 steps to get the monastery. The remains of the monastery and most of the island became a UNESCO World Heritage Site in 1996. Skellig Michael has also been featured in the Star Wars movies. This was a close as we got to Skelig Michael. You can see it way off in the distance. In addition to Killarney where we stayed, we passed through several cute towns like Waterville, Sneem, and Kenmare, that I would like to explore more. It might even be nice to stay in one of them. We enjoyed our time in Kerry and definitely plan on going back. Check out the short video so you can see some of the best parts of the Ring of Kerry and also get a better idea of what driving the Ring of Kerry is like. Yes! We enjoyed our Ring of Kerry road trip. It’s such a scenic area and there are so many interesting places to explore. I wish we would have had another day or two, but hopefully, I can make it back to Kerry, Ireland. Have you done the Ring of Kerry drive? What were some of your favorite Ring of Kerry sights? Come with an experienced driver who is comfortable driving on the left and on narrow roads. Be sure to get out of the car and explore as much as you can, there is plenty to see! 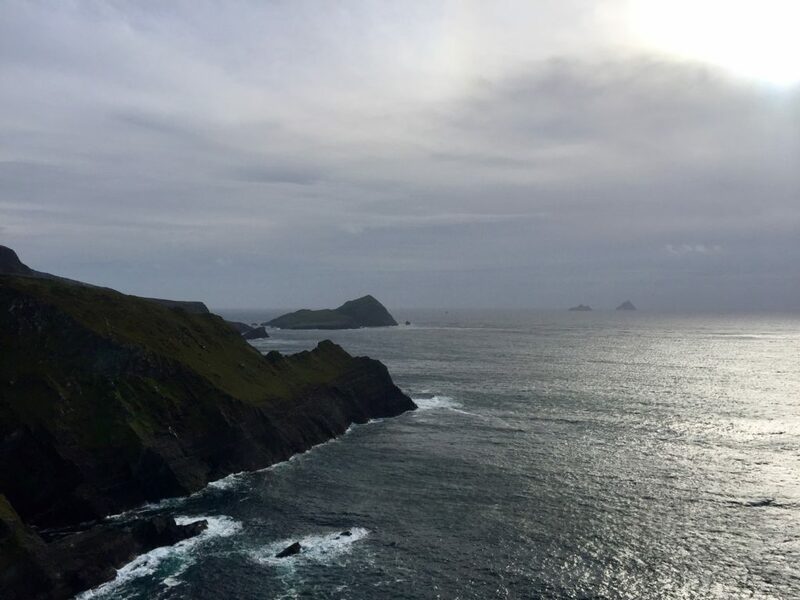 If you want to visit Skellig Michael, book it in advance! If you want to see more of Ireland (which I highly recommend), check out these Ireland itineraries. Haha I know! Unfortunately just our luck the camera was not rolling! I have photos from my Ireland trip when we had to pause for cow crossings!! The Ring of Kerry and Skelig Michael are on our bucket list! Thank you for the tips and inspiration, it looks amazing! Thanks Michelle. It really was! I hope you make it there soon. Hmm, I have never heard of Ring of Kerry. It was not until I read about Killarney that I realized this is in Ireland. Ireland is so beautiful, I am not surprised there is another scenic route to check out! Jen – Yes there are so many scenic areas in Ireland. I want to go back and see more of them. This definitely looks like a place to try out, thank you for sharing! I’m so glad that my hubby dearest is an experienced driver. Which side of the road do you’ll drive on? Penny – Yes that always helps. I am used to driving on the right. My boyfriend is English and drives on the left like they do in Ireland. As a non-driver, reading about experiences like this always make me want to prioritise getting my licence. You can miss so many great trips by not having the option of hiring a car to get around. I know the area isn’t great for public transport so this is one that I’d definitely need a driver friend for! Some stunning scenery and it looks like you saw plenty even if the weather wasn’t optimal. Anyway, if the sun had been blazing, you can bet it would have been a lot busier and your experience more stressful! Sarah – Yes you should work on getting your drivers license but if that takes awhile you could do the Ring of Kerry with a tour group. But yes it’s ideal if you can so it yourself. Love love this post! My husband went to Ireland in 2006 but never made it to the Ring of Kerry. We looked at the video together and decided we must make an Ireland trip in the next five years!! Shelley! – So glad to hear the post and video inspired you! I hope you guys get to go, you will not be disappointed! I cannot get enough of those views! The shots you took are absolutely amazing. I’ve always dreamed of heading to Ireland but this post might just give me the right push to actually commit! Stephanie – Thanks so much glad you enjoyed the post. I hope you get to visit. I know you will love it! I’ve never been to Ireland but its on my to go list! I would love to see the stone forts and hike in the National Parks. Thanks for all the great photos and tips – will bookmark this one! Kristie – So glad you enjoyed the post. I hope you make it to Ireland! I enjoyed your post and video. We were there in midsummer and decided that driving the Dingle peninsula would be a less-trafficked alternative. We weren’t disappointed. Ireland is gorgeous no matter where you go! Oh, and we found one of those two-way one-lane roads too, complete with sheep barring the way. By the way, considering you were in a car I was impressed at how steady your video photography was. Did you guys use a GoPro or a camera? 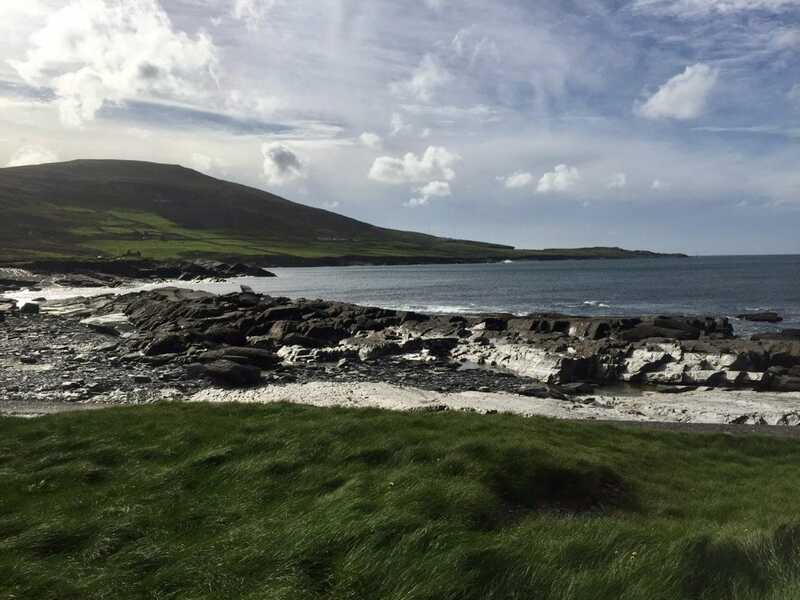 Linda – I want to go back and do the Dingle Peninsula! I have heard its really nice too. For this video we used a gopro and attached it to the visor. Glad you enjoyed it. Thanks Tanja. Glad you liked it. I was sort of hoping you caught the near collision on video but I’m glad you both were okay! I’ve heard great things about the Ring of Kerry so one day I’d like to go. The bucket list just keeps getting longer and longer – I’m going to have to live forever to complete it! Alexis – Yes I was disappointed the video wasn’t rolling too. And I know what you mean about bucket lists! Mine grows faster than I can check things off. 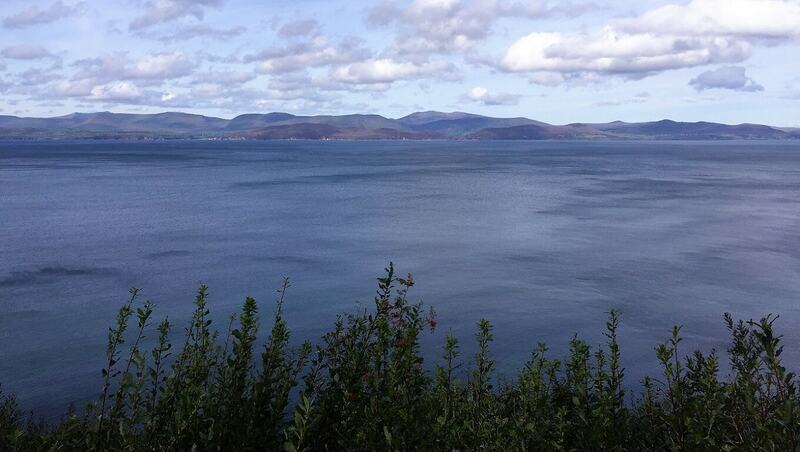 Hilary – Glad to hear you enjoyed the Ring of Kerry too. Maybe you should go back and do it on your own too? There is so much to see! Your photos are so beautiful! Glad you were safe on all those precarious roads – seems like a good idea to do this in the off season when there is less traffic. Ava – Thanks so much. It really is such a beautiful area, I hope you get to visit someday. i haven’t done the Ring of Kerry but in general i love the west coast of Ireland. lots of opportunities for very dramatic scenery! it’s great you got to enjoy it without the summer crowds. the advantage of off-season travel! Eileen – Yes the west coast of Ireland is wonderful. I really want to explore more of it and yes we were lucky it wasn’t crowded. 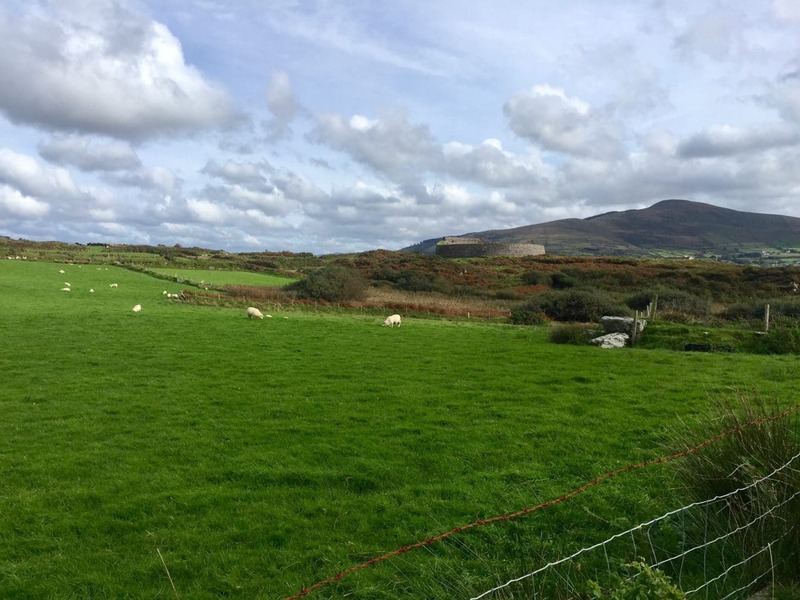 Paul and Carole – Yes so many beautiful areas in Ireland. I definitely want to go back and explore more too. This looks great… but my boyfriend will have to do the driving here!! I am a panicky driver haha! Megan – I don’t blame you! Whatever you have to do to get there, do it, because it really will be worth it. Love this! The Ring of Kerry is one of my favorite spots in the world. Great pictures! Thanks Danielle, so glad to hear you enjoyed it too. This looked epic! I’m a sucker for cliff roads although, like you, I prefer it when someone else is driving. Really want to visit Skelig Michael Island now! Isobel – It really was amazing. Yeah I really want to go to Skelig Michael too. I think when I go back I will plan a couple of days there just to make sure I am able to do it one of the days. That coast is absolutely stunning! I always end up making my partner drive the narrow/tough-to-navigate roads too – no shame there haha! I hadn’t heard of the Ring of Kerry before so will have to look into doing this drive one day. Flo – Thanks. I hope you both get to do this drive. It really is a beautiful area and I know you will love it. 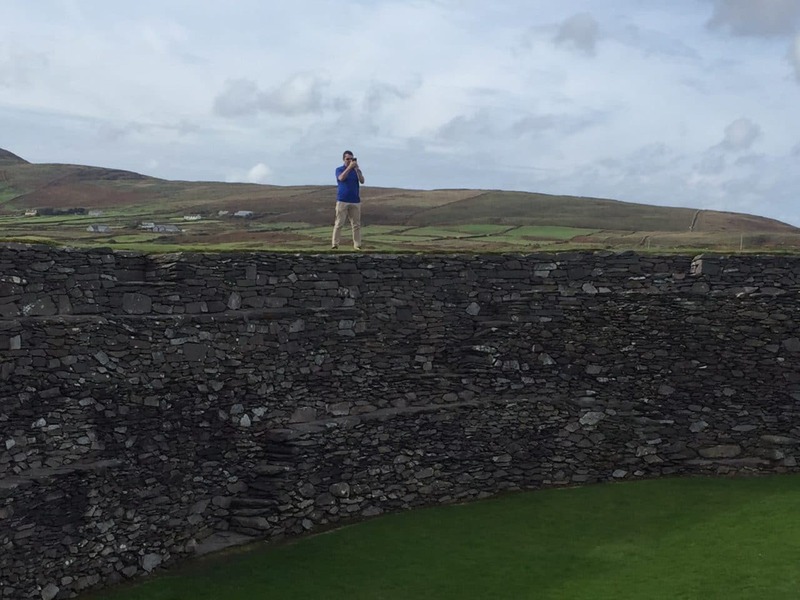 We traveled a lot around Ireland and hit some of the spots – such a beautiful country! Jeannie – Glad to hear you enjoyed Ireland too. What were some of your favorite spots? I’m actually planning to do the longer Wild Atlantic Way which I guess will cover the Ring of Kerry so this post is great timing for me! 🙂 The video does show some very narrow roads but I guess they are still manageable? Dariel – Excellent. Yes the Wild Atlantic Way does include the Ring of Kerry. The main road wasn’t bad, the side roads that you take to get to some of the attractions were pretty narrow but yes we managed. This looks like a beautiful drive! So peaceful and great views. Allison – Yes it is beautiful. We went at the tail end of the season so it was peaceful. During the summer months I have heard it can be pretty crowded. Love this. I am a big fan of your photos on Insta. I love all the moody clouds and lighting. For me i think it adds an extra special touch – especially since the weather is really like that a lot of the year. Nicki – Thanks so much for the compliment, it means a lot coming from you! I love moody photos too. Ahh Ireland is so beautiful! I love being outside and hiking, so this is perfect. The only problem is, my husband has already been so I’m campaigning to go back soon! Great post! Ashlyn -Glad you liked the post. I think you can convince your husband to go back, there is so much to see! I love the green hills of Ireland. I’d happily go back over and over. I haven’t done the ring of Kerry before, but I’m feeling suitably inspired! Laura – Yes, I really love Ireland. I think this was my 5th trip there and I still want to go back and explore more! David – Yes, we stopped a lot but really ran out of time. We want to go back so we can explore more. It is funny some people have told me they did it in half a day – it’s sad all that they missed out on. Wow these shots are fantastic—Valentia Island is now on my list! Kyle – Thanks so much. I know you will love it there. I did a road trip up the west coast of Ireland in October 2014, and this makes me want to go back so badly!!! Will definitely check this out again if I ever get the chance to drive the Ring of Kerry! Emily – Glad the post inspired you. What road trip did you do before? This road reminds me of the 17-Mile Drive in Monterey, California (especially the Kerry Cliffs): it’s spectacular and you have to stop along the way to enjoy the scenery and attraction points. But unlike the 17-Mile Drive, the Ring of Kerry seems more narrow and dangerous. Judging from your description and beautiful pictures it seems worth driving this road, but I would be very scared to do it. Anda – The main Ring of Kerry Road is not bad at all, it’s just the side roads to get to some of the attractions that are narrow. We were lucky it wasn’t too crowded (we went in Oct) so we could take our time. I do think you would really enjoy it. Junaid – Thank you! Yes both the stone forts and Kerry Cliffs were amazing. For the most part we were lucky with the weather, but we did get a little rain. I hope you get the chance to visit the Ring of Kerry one day. Lolo – Thanks so much. I’m sure you won’t be disappointed. Anna – Yes. We were lucky, we went in October it wasn’t crowded. I hope you can find a driver, I know you would love this!